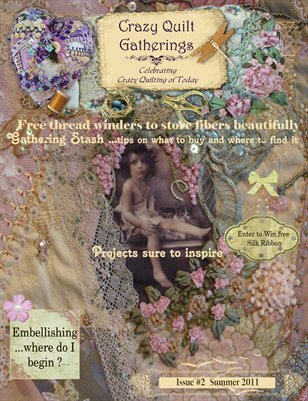 Second issue of Crazy Quilt Gathering magazine. Summer 2011. Crazy quilt projects, tips, artists to meet. Crazy quilt bell pull, Crazy Quilt watch chatelaine tutorial, Crazy Quilt watch cuff tutorial, Silk ribbon embroidery, Bullion stitch pansy, Round Robin information, and so much more.